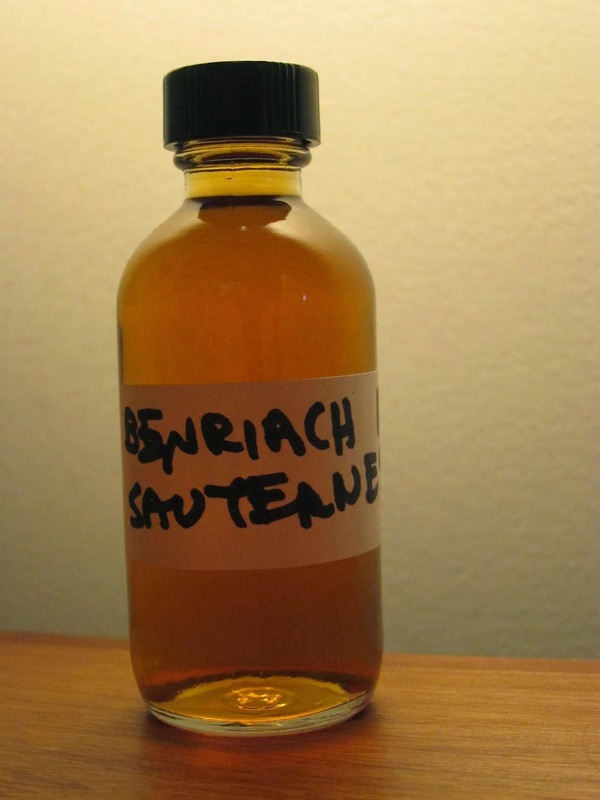 Benriach 16yo Sauternes Finish (46.0%): This time I have an unofficial sample on my desk left over from a tasting we did long time ago among friends. 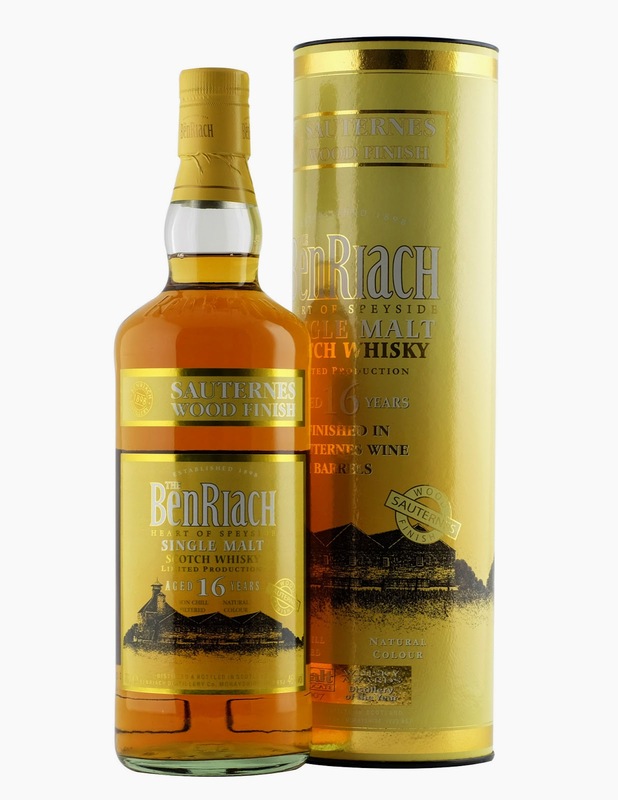 It is a 16 year old Benriach aged in ex-bourbon barrels for almost 13 years and then transferred to Chateau d'Yquem Premier Cru Superior Sauternes wine casks for approximately 30 months. Only 1650 bottles of this expression have been released. Color: Beautiful: Shining! Polished copper, clear amber. Nose: Orange marmalade, struck matches and golden raisins. Honeysuckle, baby bananas, zante currants and Niederegger marzipan bars. Quite sulphury and adding water does not help with that problem at all... It's a little rubbery now. Latex gloves, new bicycle tires and custard just about to get bad. Palate: A little less sweet and spicier than the nose suggested. Almonds, orange blossom honey, ripe Turkish figs. Hint of smoke, barley cookies, nutmeg, ground cloves and vanilla... Oops, adding water made it very thin and watery. Also very sweet now... Too late, damage is done... Finish: Got even sweeter at the finish with slight burn at the back of the throat: Fried bananas with cinnamon syrup (Thai style), white chocolate and toffee. Also strong sulphury notes resurfaced. Overall: I hate to say but this particular expression didn't quite work for me. Not my cup of tea... I love Benriach spirit and I am a big fan of their standard expressions like 16yo, Curiositas and Sherry Wood. I also love Sauternes wine very much but somehow something went wrong along the path. It is mostly one dimensional, kind of flat and way too sweet for my palate. Actually now when I think I really don't remember any Sauternes finish I really liked. That wine is too demanding from the whisky I think. Maybe second fill Sauternes casks would work better... Thank you very much to Soner Tunay again for the sample..!